On a new trail: Gouthami, co-founder and CEO of Travel Another India, in her office in Chennai. Chennai: Travel Another India (TAI) is helping city dwellers get a taste of life in rural India and simultaneously bringing economic benefits to villages. Not all tourists want to visit places known for ancient architecture, busy bazaars or sunny beaches. There are those who wish to experience life as it is among the simple villagers of India, says Gouthami, founder and chief executive of TAI, who uses only one name. Guests typically come on a three-day trip, during which they eat village food, watch or participate in village dances, sports and farm activities, and buy or even learn how to make handicraft. They also live in specially built guest houses, or old houses that are renovated in the local style and using local material. TAI charges ₹ 5,000 per head for a couple going to Pranpur in Madhya Pradesh and ₹ 9,900 per head for a couple going to Leh. So far, around 200 people have visited these destinations through TAI. 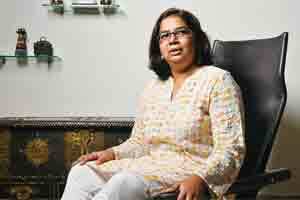 It was while setting up a women’s development project in Kutch some years ago that she got the idea for a social entrepreneurship venture using tourism. TAI was registered as Responsible Tourism Consultant Pvt. Ltd in 2009. But turning the idea into reality was not easy. Two other destinations Gouthami set up with the help of local NGOs—Banavasi and Channapatna in Karnataka—could not be sustained. “We learnt valuable lessons on how to structure and work with village tourism committees, (how to) be more careful on the kind of contract they sign and (that) monetary transaction should be transparent and it should be handled by us," she says. TAI now wants to scale up to eight locations in the villages of Orissa, Andhra Pradesh, Rajasthan, Gujarat and Tamil Nadu in a year’s time. But Gouthami says the organisation is quite particular about which villages it chooses to develop. The top selection criterion is safety and security, so TAI doesn’t choose villages that suffer from left-wing extremism or caste conflicts. The distance from an airport or railway station is also important, and TAI tries to develop destinations that can be driven to easily. The organisation also tries to get a villager who will take the responsibility for tourists and help them in case they face problems. TAI has so far incurred an expenditure of ₹ 19 lakh. Gouthami says the organisation has made small profits, but does not specify how much. “This year TAI may not report profits as we are not doing consulting service aggressively, which we did in the first two years. That funded us through and helped us be in the black." Winning the Cartier Women’s Initiative Award for innovative social business last year, with a prize money of $20,000, has helped, she says.